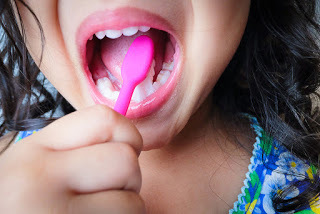 Why It’s Important To Keep Your Gums Clean - Adelberg Montalvan Pediatric Dental PC & Orthodontics too! Everyone is well versed in the importance of keeping your teeth brushed and flossed. However, it is equally important to clean the unsung hero of your mouth: the gums. The gums are often neglected, which leads to gum disease. Gum disease is infection that affects the tissue and bones which support your teeth. There are two basic types of gum disease. One type is gingivitis which solely affects the gums. Periodontitus affects the bone and supporting tissue around the teeth. Keeping your gums clean will help prevent gum disease. Receding gums is another symptom of poor gum cleaning habits. This condition is created when gum recession occurs and pockets are formed between the teeth and the gum line. This causes the gum to pull back and expose more of the tooth, or even the tooth root. Also, the pockets formed create a pleasing environment for bacteria to build up. Left untreated, this can eventually lead to severe damage to the supporting tissue and bone. Once the supporting structure of the tooth is weakened, the result be loss of teeth. Another symptom of gum disease is swollen and bleeding gums. Most people have experienced this at one time or another, but even though there are many reasons for your gums to bleed, it is wise to examine how you are taking care of your teeth and gums to figure out the root of the problem. Gums play a very important roll in your dental health. For example, by keeping your gums healthy, you lower your risk of heart attack or stroke. Most people don’t realize that bacteria in their mouth can make its way into the bloodstream. This increases your chances of a heart attack or stroke. Taking care of your gums also prevents or minimizes diabetes. Glucose levels are affected by many variables, and gum disease is no exception. Diabetics are more susceptible to gum disease. When a diabetic suffers from gum disease, their glucose levels can be adversely affected. Gum health plays an important role in overall. Be sure to have regular check ups and brush your teeth and gums every day for a healthier mouth and body. Contact Adelberg Montalvan Pediatric Dental today!